Do you want healthy and happy fish? Stupid question. Of course, you do! In an aquarium setup, poor water quality and good quality water can look identical. 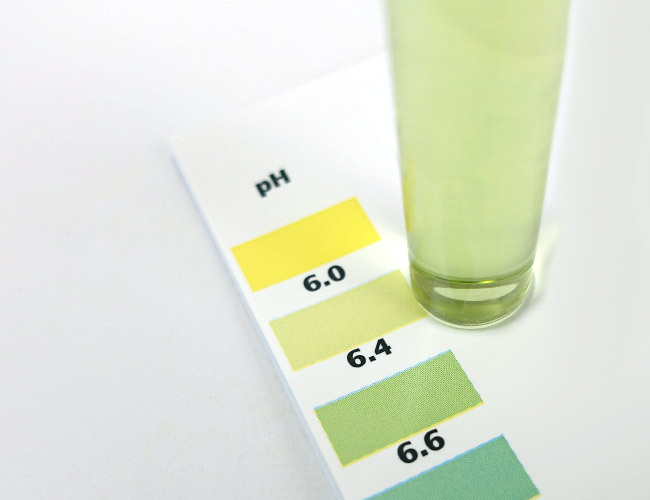 Let’s say that the water in your aquarium has ammonia levels that are too high. The problem is that you cannot tell with your eyes. But to your fish, the difference is obvious. Painfully obvious. Since poor water quality can cause your fish stress and also lead to disease and even death, it’s something that you want to monitor closely. Well, the water on the right actually contains enough ammonia to kill most fish. While the water might look fine to you, your fish could be suffering! So, how do you test for something that your eyes can’t see? That’s where an aquarium test kit comes in – the best way to test the water quality in your aquarium! What is an aquarium test kit? What is the best beginner’s aquarium test kit? How do you use an aquarium test kit? How often should you use an aquarium test kit? How accurate are aquarium test kits? An aquarium test kit is designed to measure a specific water parameter. I know, I know, measuring things is boring! But if you want to have any success keeping fish, then it’s something you must come to terms with. The reason a test kit is so important is that an imbalance in water parameters can cause chaos in your tank. For instance, take nitrites – if the levels in your tank rise too high, your fish are going to die. By constantly testing the water with a test kit, you ensure the water parameters are within safe levels and quickly act if they are not – saving the lives of your fish! 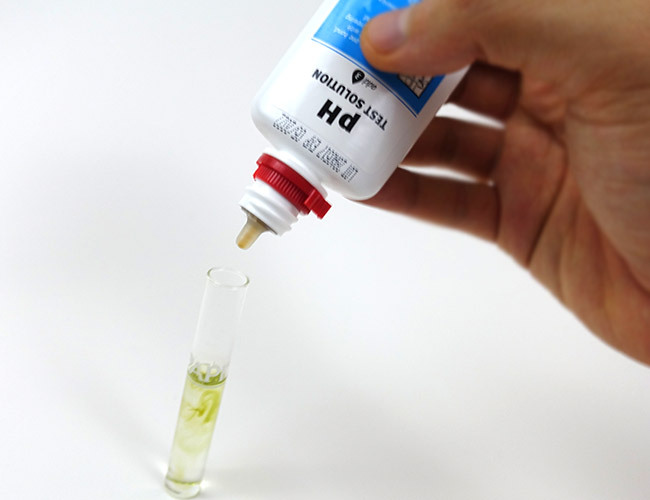 To put it simply, you add both aquarium water and a few drops of testing solution to the test tube. Wait for the solution to change color and compare it to the color card to get a result. Sound confusing? Don’t worry, it’s really easy. I’ll guide you through the steps of using a test kit later in this guide. While it might not look like much, this simple little kit is your frontline defense in the battle for good water quality… It doesn’t matter whether you are a beginner or expert, a test kit is an essential piece of aquarium equipment. You must have a way to test the parameters of your water! You should also note that a test kit is only capable of analyzing a single water parameter. That’s right, just one. You need to purchase a test kit for each water parameter that you want to check. So, if you want to test for everything on that list, you need to buy 13 different test kits! Fortunately, you won’t need most of these. The exact parameters you need to test for entirely depends on your tank setup. In fact, for most beginners, you only need a few test kits to get started – ammonia, nitrite, nitrate and pH. And possibly KH, depending on your water source. Every test the average beginner needs for their aquarium comes in a single, cheap and affordable kit. When multiple test kits are packaged together, it is referred to as a master test kit. The API Master Test Kit. Not only is it affordable and easy-to-use but accurate enough to give any beginner a good understanding of what is happening in their tank. And best of all, they can be found anywhere. 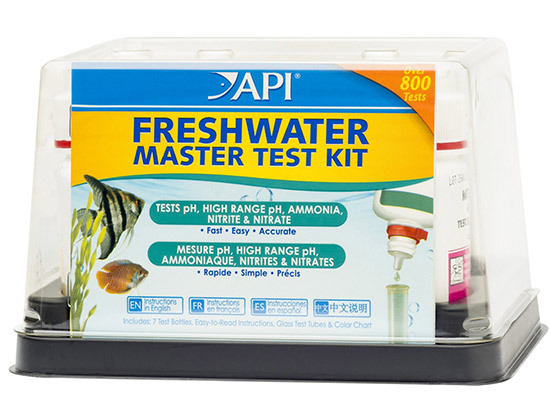 I would actually be shocked if your local fish store didn’t keep API Master Test Kits on the shelf. Each master kit contains enough tests to lasts for years. 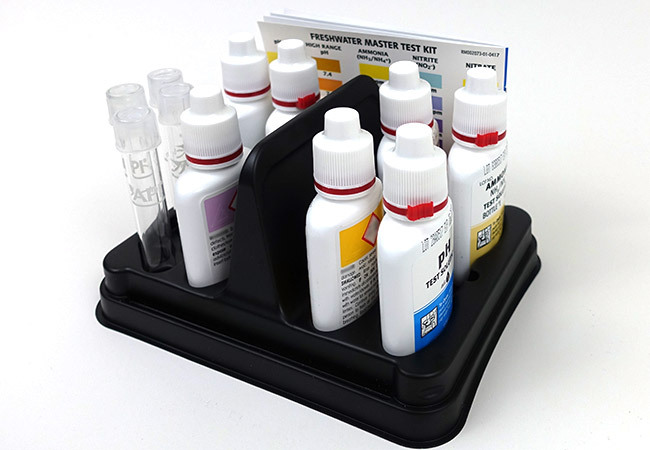 If you run out of a specific test kit, you can buy refills separately – although between you and me, it’s cheaper just to buy the complete master kit than each refill on its own! But perhaps my favorite part about master test kits is that they keep all your testing solution bottles neatly organized in a single container. It’s easy to accumulate a collection of test kits and if you lose those bottles, they are useless! While there are many other brands on the market, the API kit is one of the most affordable. Combine this with reliable results, and it is the hands-down best aquarium test kit for beginners. Using an aquarium test kit is so simple that even my mother could do it. Even with her shaky hands and poor eyesight. Love you, Mom! 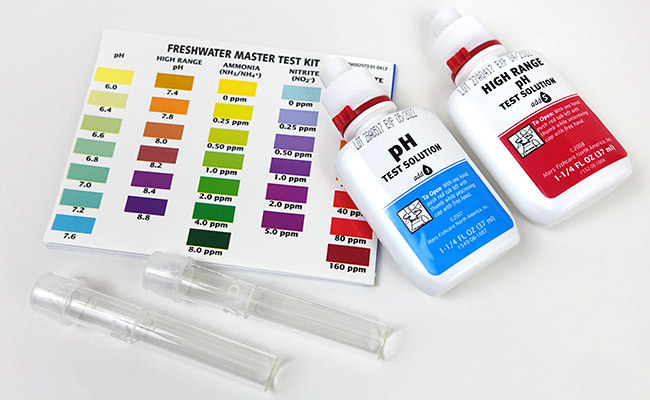 To show you just how easy these test kits are to use, I’ll take you through the process of using an API test kit to find the pH of my aquarium. You see that water in your aquarium? Well, you are going to have to get some of it into this tiny test tube. 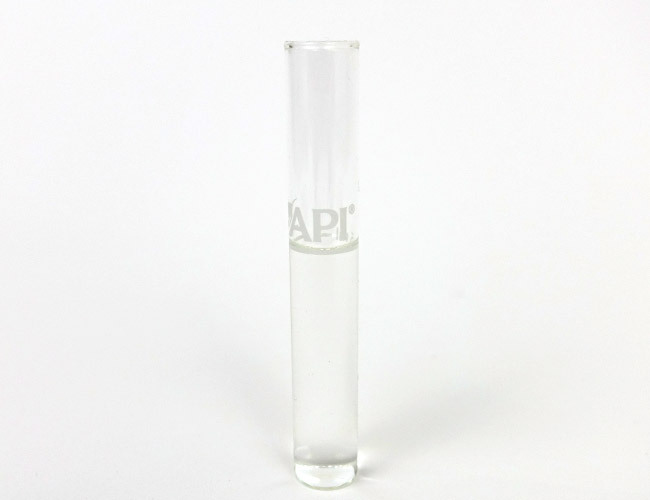 While you can dunk the test tube in your aquarium to fill it, it’s difficult to measure out an accurate amount – the API test kit I use here requires 5 ml, to the line on the test tube. Another reason why you shouldn’t dip the test tube into your aquarium – Any leftover chemicals from the last test can sneak into your tank. 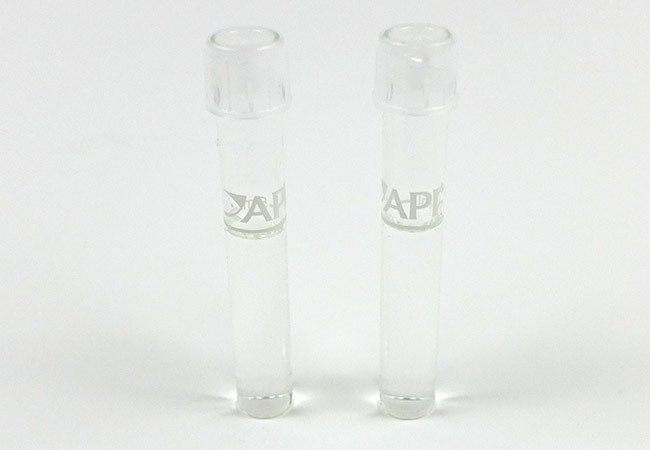 I use a disposable pipette like these to transfer the water. Trust me, when it comes to accurately measuring out aquarium water for a test kit, these things are a godsend. Next, grab the testing solution and add three drops to the test tube. A colored cloud will begin to form in the water as the drops are added. Check that the testing solution hasn’t expired – the expiration date should be printed on the packaging. Using an outdated test kit could present accuracy problems. Fortunately, test kits generally have a long shelf life. The test kit I picked up for this guide doesn’t expire for four years! Give the test tube a light shake. Doing so will make sure that the testing solution has evenly mixed with the water. The mixture inside the test tube should now be a single, uniform color. Step 4: Match it up! Now, all that’s left to do is to match the color of your test tube with the color chart that comes with the kit. Whichever color is closest is the result. An aquarium test kit and two minutes of my time reveals that the pH of my aquarium is 6.4. An accurate result in minutes. 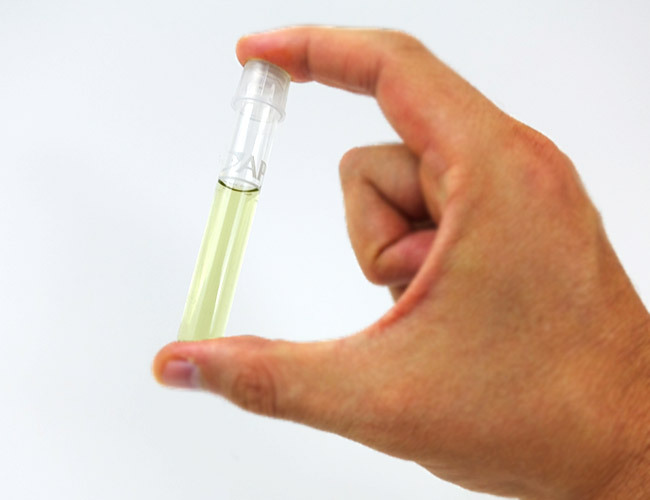 It’s no wonder why test kits are the most popular method for testing aquarium water. Note: Always refer to the instruction manual for your specific test kit. The exact steps that you need to follow can vary between test kits, even for the same brand. If you don’t follow the instructions, your results may not be accurate. When you first cycle your aquarium, you should test your water every day so that you can keep an eye on how your new tank is progressing through the nitrogen cycle. Once your tank is set up and cycled, and you have developed a good maintenance routine, you can drop the testing down to once a week. Of course, if you notice any irregularities in your aquarium, such as stressed fish or cloudy water, test immediately – you might find that a single water parameter is responsible for the issue. Test strips – Least accurate, and I recommend that you avoid them. While test kits are accurate enough for most fish keepers, they are far from precise. Notice how the scale increases in large increments? Jumping from 0 to 2.5 isn’t exactly pinpoint accuracy. But again, this isn’t an issue for most of you. 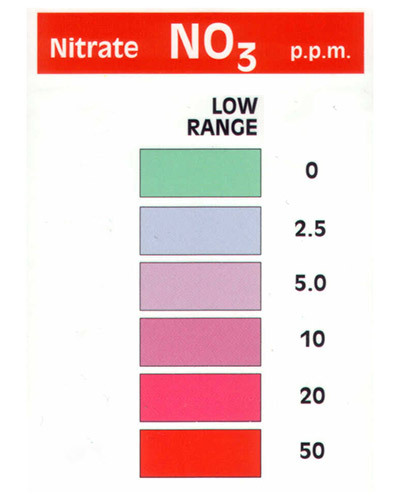 You see, the difference between a nitrate level of 0 and 0.01 makes little difference to the average fish keeper. Most people simply will not need this level of precision. When do you need a little more precision? If you are raising rare, sensitive corals, plants or fish. Or perhaps if you need the perfect water parameters to breed fish. These are not exactly common scenarios, especially for beginners. Why shouldn’t I simply skip the test kits and go with the most precise option. Well, you can. If you have deep pockets. It may surprise you to learn that a single digital meter can cost hundreds of dollars. And, you will need one for each water parameter you want to test – fish are great and all, but they are not worth mortgaging your house! Given that aquarium test kits are affordable, long-lasting and easy-to-use, there is little reason that the typical fish keeper would need anything else. They may not be the most precise, but aquarium test kits are perhaps the best way to test the parameters of your aquarium, at least for beginners and those who treat this as a casual hobby. The biggest reason for their popularity is that they are inexpensive. And given that fishkeeping gets expensive rather quickly, I believe that is a perfectly justified reason. I mean, as a beginner, what would you prefer? Spend the extra money on testing equipment or drop some cash on some exotic fish? To me at least, it’s a no-brainer. Add the fact that aquarium test kits are more than capable of returning an accurate result, and you have an essential aquarium tool. 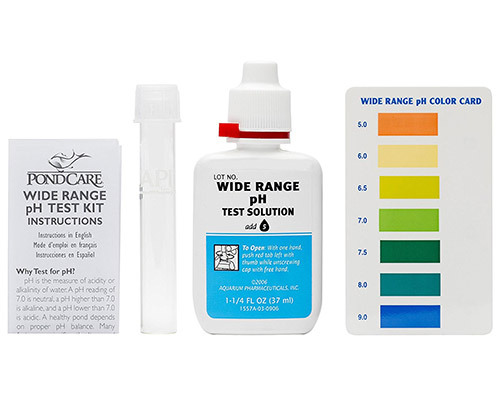 Do you use a test kit to monitor your aquarium? Let me know in the comments below! I just bought a tank (5 gallon) 3 weeks ago and then was given a 10 gallon for my birthday, on the same day. Sigh. I can’t tell you how much time and money I’ve spend on these little things. I had 3 mollies and 3 guppies in the 10 gallon and it was cloudy from setting it up yet but all API Master Kit tubes numbers were 100% within great area. I was testing it daily since I’m OCD about these little guys. 🙂 One of the mollies, of course, had babies the second she got in the tank and so I set up the 5 gallon and put the little ones in there when I realized OMG there’s babies! They’re nice tanks – real plants, a snail each and decent gravel. Two days ago I noticed one of the guppies laying on the bottom panting and I knew it was dying. When I’d go to remove it, it’d flee away only to fall on it’s side at the bottom or stand on it’s tail on the bottom. It was hard to watch and yep, this morn I found it dead hiding behind a rock. Water tested fine. 100% on all counts. By the afternoon I noticed 2 other fish doing this “hiding up at the top” thing and fanning frantically. At a loss I brought a water sample to the local Fancy Aquarium Fish Store, which everyone hates because they are arrogant, can’t be bothered and are too cool to talk to you or sell you fish. They did a test strip test and it showed I was utterly hammered with ammonia. The fish had ammonia poisoning. They sold me some “Stability” adjuster, told me to add the capful to the 10g and half a cap to the 5 and all I could do was wait. Maybe they’d all die, maybe not, maybe they’d recover, maybe not. As I type this, all but one is not doing well. I can tell they’re going to die. I asked the guy at the store, since I’m new and dumb at all this, “Oh! Should I buy those strips? Do you sell them?” and he quickly said NO. (I was kinda of just doing this to be a jerk because I have the Master Kit and they weren’t really talking to me. They pulled out the strip, looked at each other knowingly, and acted like I wasn’t there. So I was being a pest on purpose) I noticed he’d turned the can of strips away from me so I could’t see the brand name and they both briskly walked away from their test table when I asked if I ought to get those. I thought either they have a magical, wondrous way to test water or they’re cheap strips and they just like charging people to test water. I have looked online all over and don’t see anything sold in this type of can. They were the strips with the little individual pads spaced out, long white strips, and he had one with several on them and then a 2nd strip with just 1 on it. After looking I assume this 2nd strip was Ammonia since I see strips that look like this but don’t have ammonia on it – that’s separate. The can was tall, white, cardboard, and had the color-test- result grid on the back with the colors running vertically, not wrapped around the can. So, I’m doing what I’m told. I have every chemical the Pet store sells to adjust things as I’d need and I have been meticulous about reading and learning. I just cleaned out 50% of the 10 gallon tank’s water 5 days ago and added PRIME and a bit of STRESS COAT. As I’m reading how inaccurate strips can be, I wonder then what the problem here is – the snooty fish store and their test strips or why didn’t the API test kit’s stuff show me I had a massive problem? I am sad I will lose my fish, I think the frys are ok. They hide so much I can’t tell, but they at least aren’t up at the top or at the bottom heaving and shaking. I asked the Snot Head fish guy if they could possibly have “shimmy’ or a bacterial or fungal thing and he said NO! Like I was just stupid, and said the stuff he gave me is like a sponge in a smoky room and I just have to wait until the ammonia goes through the chemical. It will take a day or so and if the fish die, they die. I am confused, but always happy to learn and happy to keep smugly thinking the fish store people up the street are jerks. Advice please? and thank you! Wow what an ordeal, I’m so terribly sorry to hear you have gone through this. Your problem was almost certainly that the tank was uncycled. This is the first step to every tank should go through before adding fish. I suggest reading up on my cycling guide for more information about this process. Your theory on the test kit is correct – they used two test strips, a 5, 6 or 7-in-1 and an ammonia strip. All ammonia strips are separate. As for the brand, the reagents typically used on these strips are identical, so it shouldn’t matter which you choose. With that said, an API master test kit should definitely be picking up excess ammonia – it’s what it does. Are you checking in natural daylight? Indoor lights can make the test colors look off. For reference, here is an ammonia progression chart using the API test kit. It’s colors will vary according to your screen settings, but it should give you a rough idea. I was using IPA tests for some time. Recently it was a huge (and expensive) disappointment. all of a sudden Nitrite test in the kit is “Yes or NO”. I got some algae problem in my planted tank, so I started to look what is the cause for this. I was not testing water for last couple years, there was no need, so I was surprised when test reading was around 80ppm. I started to make daily 30-40% changes. By the end of the week test results was the same. I tested my RO and my tub water. 60ppm. Ok, probably bad test. I bought a new one. The same readings. 80ppm for the tank, 60ppm for tub and filter, 0 for bottled water and water that was left from resent rain. So, I desided that a filter that may be not working because something happened to membrane. I ordered the whole new cartridge set. Test readin for filtered water changed to 0. Ok, filter is working, test is working, 60 ppm is above the recommended federal limit for tap water. I would say that with 60ppm nitrate its non potable water. And my annual water quality report tells that average Nitrite level is 0.4ppm. We are having a local catastrophe here. so I requested my water utility take a sample to get tested at a lab. They came back with 5.6ppm (More than average 0.4 but That may be a result of last two weeks heavy rain), a massive difference from what I measured. I still was concerned and paid to accredited lab to do tests for me. 5.7ppm. So water company was not lying. I started to mix RO and tub water to see different test readings. There was no orange readings at all, only red and yellow. So, I guess, test is telling me only “almost no Nitrate” ore “there is some Nitrate detected” but not telling how much. This makes test completely useless. I know that there are some Nitrates in my tank, I need to know how much. And I am not the only one running into this issue with that test. I am a little confused here, are you talking about API? (you wrote IPA), if so, I wish I could help you here. I am just wrapping up a test where I have reviewed a variety of different tests such as seachem, salifert, API, etc. and all of them are pretty much bang on when used correctly. While some are certainly more precise than others, None were out so much (or tested false positives in RO water) that I wouldn’t recommend them. All samples used in tests were sent to a lab in Germany to verify accuracy. I do have to ask, are you testing indoors, with the lights on? This can drastically skew the colors given off. Ideally, you would want to test outside in natural daylight or use a daylight globe that is used in photography. Is there a reason why my ammonia test isn’t working? For a reading of 0ppm it says it should be green but the solution I have remains clear. Do I have a faulty test kit? It certainly is possible you have a faulty ammonia test. If you check the expiry date printed on the bottle, is it current? You gotta hold onto those! The color matching cards included in the test kits are like gold – without them you are flying blind.